"Lone Survivor clings to what she has - Running Shoes?" 5 years after Zombies inherited the earth few survivors remain. I am one of them. I was a runner before the world ended and I guess I'm a runner now. Needless to say the new world brings it's own set of bloodthirsty dangers. I'm taking survival of the fittest literally. Dead Running has not been reviewed yet. 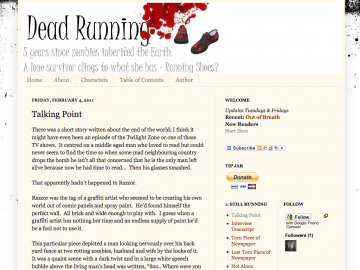 Dead Running has not been recommended yet.